Welcome to the AccountNow complaints department brought to you by HissingKitty. Experienced poor customer service? We make it easy to file a formal complaint against AccountNow online. Simply use our free form and your feedback will be instantly forwarded for review. Need to contact the AccountNow corporate office? We have the mailing address, phone number, and email address listed below. I did a bill pay and your system duplicated it. I called immediately on Monday 4/8/19. The two bill pay was cancelled. I was told it would take 24/72 hours to get this back on my account. As of today 4/16/19 I still don't have this back on my account so that I can pay bills. I keep getting the message from Customer Service that they haven't received an update as yet. I work as an accountant and this is not the way you handle someone else's money. I have called everyday and I get the same message. I just don't understand. I call my account now bank card to see how much that was in my account on March 27,2019 and the it stated that I only had $226 .po in my account so I call the bank and stated that my funds was pending. I have done a dispute in referring to the claims. 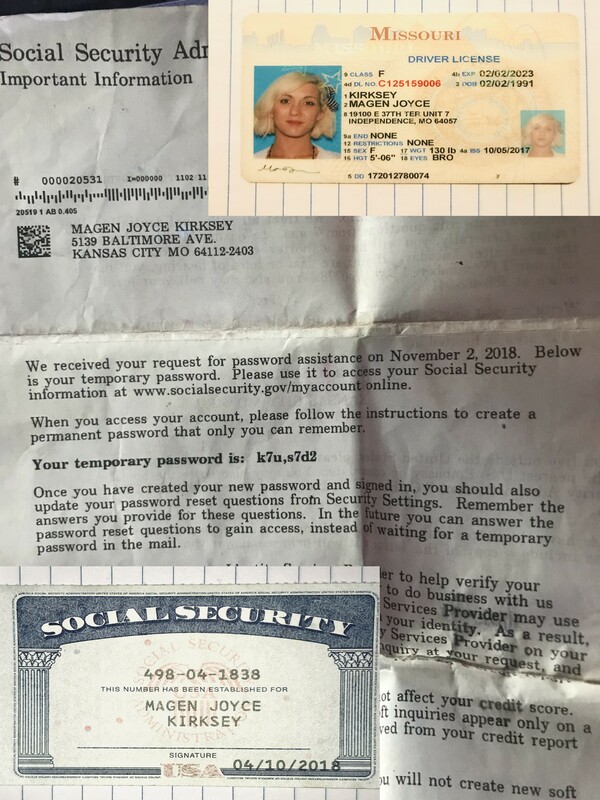 the bank stated that I would get my money's, now they are telling me I'm not going to get my ssi money's back .I need my money's. the last transaction i used my Visa card for was Aldi Store for thirty something dollars on Sunday this week. Everything else is not my doing. I had almost 8,000 dollars stolen from my account it’s about to be a month now that they still tell me there’s only an investigation in progress. Ws complaints with the Better Business Bureau I realize that missing funds and compromised accounts are common place. I am sorely disappointed and disatisfied after 6 years of patronage with this company. I am currently seeking avenues of legal ways to hold account liablr for the missapropriation of my money along with negligence to orovide safe gaurds when handling the money of card holders. I am certain this company needs to face a class action suit to end this atrosity and the theft of funds from their customers. I do believe these mysterious occurrances are company related. I received my income tax return refund my account was restricted I was told to send in documents I did was told to wait 3 days I did. On the third day I was told I had to send and updated bill I did I was told I had to wait 3 more days. A manager hung up in my face because I was upset and fussing I was not allowed to pay my rent and was giving a eviction notice I have to wait 6 days to get my money and I was told the department is based on a first come and first serve basis what kind of company tell their customers this l customer are important not the first come first serve. I've been waiting on my money for a week and I'm praying I'll have a roof over my head when y'all decide to give me my money I should have had my money Friday customer service is very unprofessional and need new employees that will put the customers needs first and not a first come first serve basis. I can't tell my landlord, light bill, phone bill people that my bank is holding my money hostage they are getting tired of hearing it and so am i. I just want access to my money so I can move on. You all state you go to work from 5am to 7pm but you will not expedite your customer request after they send the documents you asked for you make them wait 3 days then say what they sent wasn't in date send it again and make than wait another 3 days when they should be first by the documents ready being there you should also have branches so a customer can have face to face service because the people on the phone barley understand you and you barley understand them English is poor making it hard for either side to understand clearly. Also a customer should never be hung up on no matter what how mad the customer is. It's your job to hear what ever they are saying not get mad because you don't understand and the customer is tired of hearing I'm sorry I understand because they don't because it's not happening to Them make a customer feel appreciate which you don't. I picked up account now because i liked the early pay. I got my check on Wednesday morning, everyone else, Friday! Everything was going great until i had to call customer service over an issue i was having with text alerts and speaking about security i made the remark that i have 2 cards, 1 to buy stuff online, stores and whatever and the other just to hold my money. Well this account now agent kept on and kept on until i said i would try another 1 from them and use two account now cards but i wasn't going to pay a monthly fee! Sure enough there was, so i called the same day i seen the charge and told the agent i was shutting down the most recent card activated. I told him why, he said no problem. 5 months later I'm trying to send my son money in Florida and the money lands on the card i hadn't used in over 5 months! The worst part account now pulled out "5" $9.95 payment! FIVE! I work for a living man! I just can't believe it! The call center is closed! So now I'm going to set and worry all night that 500 bucks is going to take off somewhere else! Using the card to card transfer, it's available on my son's card as well.. How it went to an account i thought was shut down! NO CLUE! This will have to fix itself! I can't afford to give away $50 because someone forgot to hit enter! No way this could be, something shady! I've made 5 or 6 calls to Account Now to get me nowhere!!! My account was compromised with an unauthorized payment that I'm trying to dispute unsuccessfully. i just want my money back!!! I do not have access to my paycheck. I cannot wait 5 business days to get my paycheck. your customer service is a joke. And this card is nothing but a scam. Give me my money. On July 27,2018 I received a email from account now asking me to rate an employee based on a telephone conversation that I had. Upon receiving the email that I knew nothing about, I called account now customer service and informed them that I had not called them about my account. They then told me that I had called earlier and reported my card damage.i informed them that I did not call. They deactivated my account, asked me to fax a copy of my driver's license and social security card. I faxed the documents. Because of someone else's negligence, I am without funds. They told me that I have to wait 5 business days before I can access my funds. My paycheck was deposited into that account and I have bills to pay that can not wait 5 days. I should have not been treated this way because no one from account now spoke to me about my card prior to the phone call I did make informing them about the email that I received. This is just tedious and I will be removing my funds from account now never using this bank again. They I've had four open dispute with them they are finally credited my account from one of them but right before that they closed my online account the stop the card which cannot be reinstated which means I have no access to my money after months and months of dealing with this they have no customer service phone number to talk to the people in charge of the disputes can't talk to the corporate office you can't talk to his supervisor every representative you talk to is overseas when are their main offices in San Ramon California but you can't get ahold of anybody it is a big run around they could not even give me a specific reason why they closed my account and I still have not received my money but it says when I call the card number that it's on there because they take their monthly charges but I have no way to access it. This business needs to be closed down! On 11/16 account now restricted my card over a $32 charge that I did not dispute, they decided to dispute it without even discussing it with me first. My SSI was deposited then they froze my account,I found out when I went to get groceries and propane so we could have heat for our trailer. They told me they need some documents so I uploaded them and they got them.But still hasn't released my funds it is 32 degrees at nite and we have no heat in our trailer.Can't. Find anyone there who will help me....they are rude..put me on hold from 3:30 last Friday till 6:30 Saturday morning. I have been on the phone with them every day since this happened for up to 5 hours each time..i have been put on eternal hold.and hung up on, and told that they can't do anything to help me and there is no one they can send me to who can. I find that to be a excuse and a lie..now they say they are sending me a check that will take them 5 weeks to get here, so I filed a complaint with consumer affairs and it's already posted on their website.also been in contact with federal trade commissioner..department of justice..the office of the inspector general...the attorney general in Washington ..and the consumer protection office in Washington DC.and better business bureau. Also met about 40 other people online who has had similar problems with this company,and has a attorney willing to file a class action suite against them and I joined the law suite soon you will be seeing a ad on tv about it and online I suggested the tv commercial the more people the bigger the pay out you know. Now I am almost positive I won't. Hear anything back from anyone at account now, but had better get my money in the next week,too bad I am going to have to have them investigated as embezzlers and money laundering. Hey they could be using our money to back the Taliban. maybe I could do to them what they have done to me turn their world upside down and great turmoil for them. Well you have my money I want it and need it to live in the morning am calling social security and report them for stealing my money from the government and filing a complaint and telling them about all the other people they have done this to and email a request and have asked any of those hundreds of others to do the same ask the social security to not direct deposit any checks to account now or green dot accounts. Until I have my money in my hands I will post on each and every website I can find and tell everyone how you treat your customers..oh your welcome to call me if your not afraid to face someone you are unable to push around. The name is Pamela voelker last four on card is 2508 you have my numbers my email is..
walkerpamela253@gmail.com..get ahold of me dare you to if your not chicken shilt..i will be waiting to hear from you but won't hold my breath. My name is Frances Anderson & I was on the phone twice with your so call repetitive. I asked to speak to a supervisor & they hung up on me . My complaint is about an ongoing problem with my gold Visa. I should not have to send a copy of my drivers license and social security card to this company every time I have an issue with my card. I feel I have money missing out of my account at AccountNow. I requested a transaction history be mail to me because I can't access my account on line. But they already have all my history online. I will eventually in the very near future take my business somewhere else. Almost makes me think AccountNow is actually an account scam! The account dispute department is not capable of doing their job. For whatever reason after my complaints I still cannot get a response as to what is going on. Stated they did everything to find out where my money is and they are very incompetent. The money was stolen at a casino but they say they cant find the error. How hard is it to view video tapes to see a persons withdrawing your funds? Avoid this bank for the fraud that they really are. I had a dispute that someone had taken my card to pay a bill. I filed a dispute, someone canceled my card. I talk with someone that the card was canceled and dispute was approved. Called the card that was suppose to be cancelled and they say the correct money is on the card I have. Your employee told me that this card was no good and another card would be sent to me with the corrected dispute and the balance original on card. He said 3 to 5 business days for the car to arrive. The dispute was approved and notification forms were completed and has arrived to the dispute department, I have been waiting on the new card to arrive for over a week. I need the money. Can you please tell me if could use the card I have that says the balance in on this card or tell me where this supposedly my new card is. Do not use accountnow. It is a terrible service and a bad idea for anyone who doesn't have money. They offer a prepaid Visa credit card, but you have to loaded with money on the website every day in order to use it. I don't know about you, but I would rather pay cash for anything I can. The idea of putting money onto card, just so I can later spend it, Does not make sense. After reading complaints online about accountnow, I can see why they are struggling to stay in business. Want something better than a credit card? 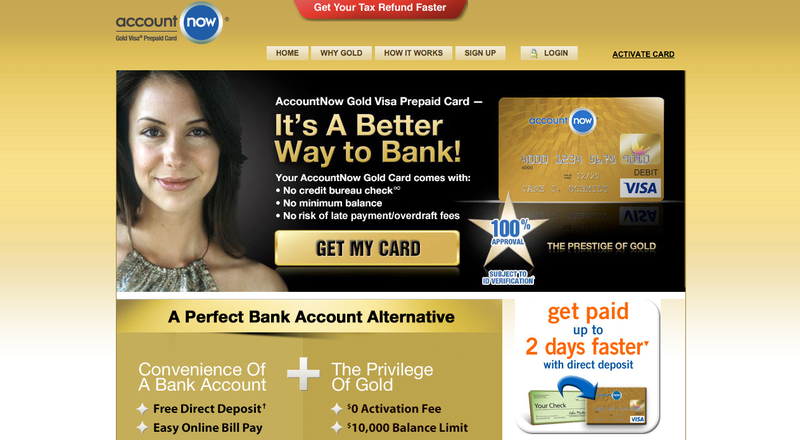 Well Account Now prepaid cards are the best replacement. A great alternative to a checking account, saves lot of your money and its safer than cash. I have taken this service and actually benefited out of it. I now don't have to worry about over drafting and I enjoy the same benefits of credit card. I can use it the same way to do online shopping, make payments etc. with low and affordable competitive rates. Account Now gives peace of mind and one doesn't have to worry about late payment charges. I recommend this to those who want a hassle free prepaid card and yet enjoy the benefits like a credit card.